Pringle Bay is a small coastal town of ca. 1600 inhabitants in the Overberg region of the Western Cape, in South Africa. It is situated at the foot of Hangklip, on the opposite side of False Bay from Cape Point. The town and surrounds are part of the Kogelberg Biosphere Reserve, a UNESCO Heritage Site. 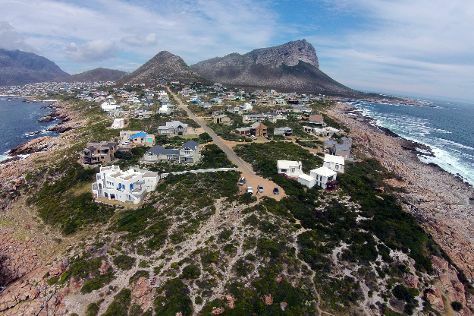 The bay is named after Rear-Admiral Thomas Pringle, of the Royal Navy, who commanded the naval station at the Cape in the late 1790s.Situated between Betty's Bay and Gordon's Bay, many of the houses in the small community are only used as holiday houses by their owners. It is accessed by the R44, which connects it to the N2.The beach is exposed to the wind, and frequently empty. The town is safe, and family friendly and is home to a number of restaurants and curio shops which serve locals, holiday-makers and passers-by. Pringle Bay is in Overstrand. Make the most of your holiday in Pringle Bay by finding out about its attractions and choosing what to see using our South Africa trip builder website .